A​s we arrived in Monterey I made a horrible discovery – my wife’s passport ​was missing. It had ​been in my computer bag ... now gone! As I replayed the last few hours in my mind I knew when it happened. Before we boarded the train in Portland I assumed that they would want proof that we were seniors and had moved the passports into the more assessable front pocket of ​my computer bag. They were never requested ​and we settled in for our overnight trip to Salinas with the train's ultimate destination being Los Angeles. All went well and the Amtrak trip was most enjoyable. During the evening I'd opened my bag to get my phone charger and computer and used the same pocket as the passports to store my phone.I ​hadn't returned the passports to the secure inside pocket and I didn't fasten the zip. Early in the morning my wife and I swapped seats. As I wanted my computer bag I tugged it out from under her foot rest. It was a bit jammed but I ​tugged it through. This had been the critical moment! This is when the passport had fallen out! “----- Idiot!” I said myself. The system is that our passports are always in the inside zipped pocket. The one time I’d been lax and left them in the open pocket one had fallen out. I immediately went into ​crisis solving mode. Step by step and covering every ​option. Find an internet connection, contact Amtrak call centre and hopefully get the conductor on the train to look for ​the passport. Contact the Amtrak Lost and Found Department. This plan started an initially frustrating search as I tried to find a way to speak to a human. As ​I've found often Google is not the most reliable resource! I ​phoned the number of the Amtrak Lost and Found Call Center. Here I encountered a very unhelpful service person who merely gave me the telephone number of Los Angeles Lost and Found department. However, when I phoned this department there was a recorded message that ​they were very busy​ - "leave ​your contact information and if the lost item is found we will contact you". This was not what I wanted to hear. I then went on to the Amtrak Facebook page and sent a message via Messenger. The response was that someone would come back within 48 hours ... also unacceptable. The next step was to log into my Amtrak account and send a direct message regarding the loss of the passport. Another confirmation was that someone would come back within 48 hours ... gain unacceptable. In frustration I decided to phone the Lost and Found call centre again. This time I was fortunate to get a very helpful operator named Debbie. She did everything possible to assist. She advised all the stations that the train would be travelling through on it's journey to Los Angeles as well as the Los Angeles Lost and Found department. We gave her all our contact information and she said somebody would contact us when the train arrived in Los Angeles. We had done everything that we could and now we waited. The train was due to arrive at Los Angeles at about 9 ​pm. At 9:45 pm the hotel manager knocked on ​ourdoor and handed us the phone. On the line was David an Amtrak representative ​from the LA Lost and Found department. ​Fantastic news! The passport had been found and handed in. 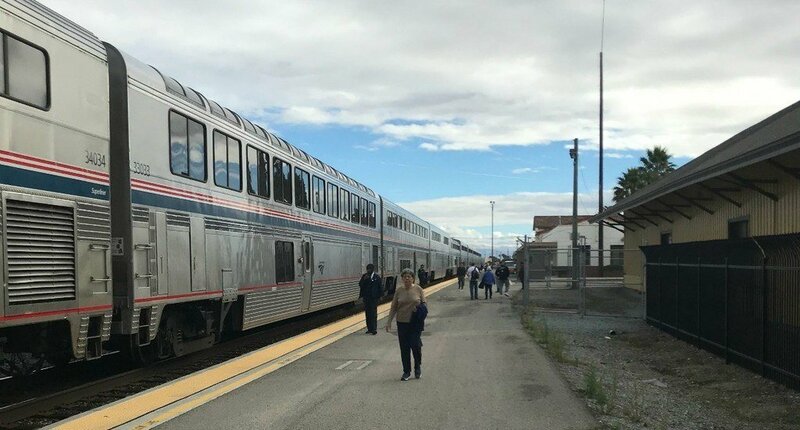 He ​said that they would put the passport on the next train back to Salinas and it could be collected any time after 4:45pm on the following day. At 4:50pm we received a telephone call from the Salinas station ​letting us know that they had the passport which we could collect at any time. Great service from Amtrak after my stupid mistake and everything turned out well. Thanks to Amtrak and all the people that made this process ​relatively painless. PS We took the local bus from Monterey to Salinas to collect the passport. An hour there, an hour in Salinas and an hour ​return. It was most enjoyable travelling through the towns and experiencing a day to day commute. Salinas is a very tranquil and appealing town … no wonder it was so loved by John Steinbeck. Have a travel routine that works then always follow the routine. I didn’t follow my passport routine. We hadn’t followed our recce system – when you leave a place like a hotel room, plane or train check the space and see that you have everything. Don’t panic and be realistic – it is easy to start over dramatizing.